Minted at officina P in Londinium (London, England) during the summer of 307 A.D.
Sutherland, C.H.V., "Roman Imperial Coinage", Volume 6 (RIC), London, p129, nr 85. Sear, D.R., "Roman Coins and their Values" (RCV Millennium Edition), Vol. 3, p179, nr. 13444.
hinterlassenen Sammlung und Aufzeichnung des Herrn Paul Gerin" (Voetter-Gerin), Londinium, Maximianus Hercules, p151, nr 13. 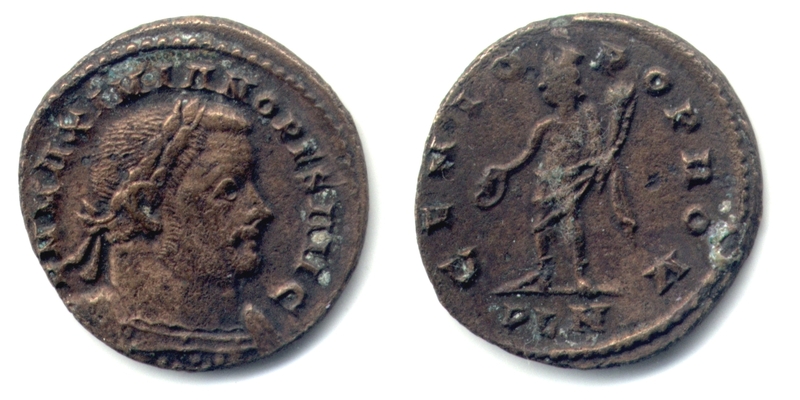 Failmezger, V., "Roman Bronze Coins From Paganism To Christianity 294-364 A.D.", nr 199aM. Cohen, H, "Descriptions Historique des Monnaies frappees sous l'Empire Romain" (C), Volume 6, p508, nr. 142. Van Meter, D., "Handbook of Roman Imperial Coins", p279, nr. 55. Suarez, R., "ERIC II - The Encyclopedia of Roman Imperial Coins" (ERIC II), unlisted (B29, O17, R70, T30, M8).